It’s that magical time of year when there’s a chill in the air, holiday decorations are up, and nonprofits around the world are ramping up for Giving Tuesday. Since launching in 2012, Giving Tuesday—the charitable counterpart to Black Friday and Cyber Monday—has evolved into an international philanthropic movement. The participation of individuals, businesses, and entire communities has made the annual event a prime fundraising opportunity for social impact organizations, no matter their size or budget. Donors are eager to participate, and organizations should ride on this wave of energy to attract support. This year, use the excitement around Giving Tuesday as a launch pad for your greater fundraising efforts. Below is a breakdown of the opportunity that this national giving day offers, as well as a couple of ways you can build on the excitement to push your larger initiatives. Over the last few years, Giving Tuesday has gained solid momentum and it shows no signs of stopping anytime soon. According to #GivingTuesday, Giving Tuesday raised $300 million in 2017, topping 2016’s $177 million yield. The number of individual donations also increased with Giving Tuesday 2017 bringing in a record-breaking 2.5 million contributions. What’s more is that the hashtag #GivingTuesday saw 21.7 billion social media impressions around the world. These numbers speak directly to the engagement and opportunity surrounding Giving Tuesday. Not only are more and more people paying attention to this dedicated day of giving, but they also tend to stick around. 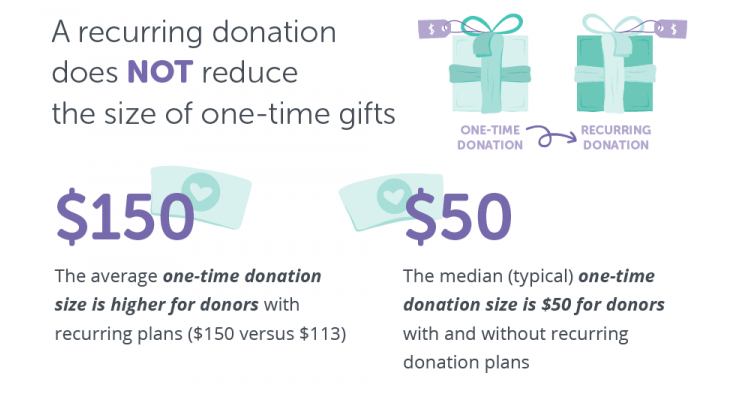 Data from Classy’s recent report, The State of Modern Philanthropy, shows that Giving Tuesday can, and should, impact your nonprofit long after the global giving day. In fact, our platform data shows that nonprofits acquire 3 to 5 times more donors on Giving Tuesday than an average day, and that 15 percent of donors acquired on Giving Tuesday will donate again before the next Giving Tuesday. The media attention surrounding Giving Tuesday continues to grow each year, raising awareness around social causes. Trends show that donors are willing to participate. It’s just a matter of what your organization will do with the increased attention and engagement. To take advantage of this global giving day, many organizations plan to launch an isolated campaign just for Giving Tuesday. While this approach will raise some funds, there are many ways to maximize the opportunity. One way, in particular, is to weave your Giving Tuesday campaign into a bigger year-end fundraising strategy instead. Here are a couple of ways you can leverage the excitement around Giving Tuesday to push your larger initiatives. Instead of running separate Giving Tuesday and year-end fundraising campaigns, simply incorporate Giving Tuesday into your existing holiday fundraising efforts. Many organizations launch their year-end fundraising campaign around Thanksgiving anyway, so simply use the media exposure that comes with Giving Tuesday to promote your campaign and encourage people to give to your organization. The revenue from the event can give you a big financial push towards your overall campaign goal. If you haven’t rolled out your year-end fundraising campaign by November 27, leverage the buzz around Giving Tuesday to officially launch your planned campaign. The excitement will contribute to a solid kickoff, building initial momentum for your campaign. According to the goal-proximity effect, people are more likely to donate when they see your organization is close to your goal, so gaining lots of traction on Giving Tuesday can set your campaign up for success in the following weeks. In fact, you can prep for a successful Giving Tuesday hard launch by planning a soft launch in the weeks prior. This is when you recruit a few dedicated supporters to start raising money before your public kickoff on Giving Tuesday. Build momentum leading up to Giving Tuesday, and you can set the stage for a strong fundraising campaign. Pro Tip: Many sponsors are willing to match gifts on Giving Tuesday, so try to find a corporate partner and host a donation matching period. This will excite donors and create a sense of urgency, which will help draw more donations to your campaign the day-of. As we mentioned earlier, Giving Tuesday is an opportunity for much more than one-time gifts and social engagement. The power of Giving Tuesday can also help grow your recurring giving program and your organization’s financial baseline. Consider leveraging the giving day to push your monthly giving program. Growing your number of recurring donations can do wonders for your organization’s long-term financial health. It can help you increase the amount people give on average each year, improve retention rates, and refine long-term planning and budgeting. On December 1st, you can launch a recurring giving campaign to acquire new monthly donors. Your ask amount may be lower, but small monthly gifts add up to larger annual contributions and better retention rates. You can also target annual donors and ask them to join your monthly giving program, and ask monthly donors to increase their gift amount. See the full Power of Recurring Donations Infographic here.